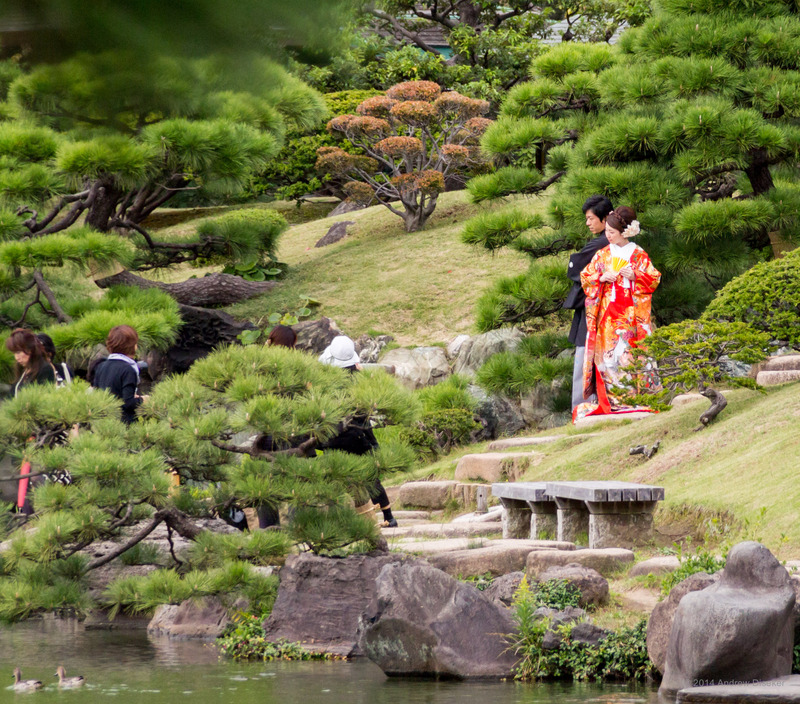 Kiyosumi Garden, Tokyo – Nerdwatch! Almost exactly 2 years ago today, October 23 2012, I was on the first full day of my third trip to Japan, a month-long excursion I called “Nerdtour 2012” (I blogged it on this site). One of the best places I went was this little slice of old Tokyo park design, called Kiyosumi Garden. It was just about 1 or 1.25 miles up the road from the apartment I stayed at, and my buddy John had been there before, so on a somewhat rainy day we set off to see this. It’s a nicely laid-out park, with a large pond or small lake in the middle, beautiful landscaping, and more turtles in one place than I had seen in a long time! I took this picture of a couple having their picture taken, I don’t know if they were models, or of they were a genuine couple preparing to get married. Either way, it was a stroke of luck getting this shot from across the lake, given it had been raining off and on with breaks in the clouds allowing the sun to shine. I plan to go back sometime in the next year, if all goes well, if not, then the year after. There is so much more of Japan to see! BTW, I wrote a small photo book that you can buy on Blurb.com!